Mental exhaustion combined with difficulty getting through the day may reflect a strong case of burnout. 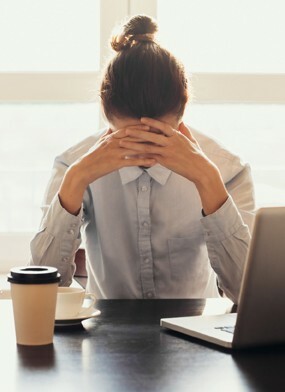 Indeed, burnout may look a bit like the “energizer bunny” collapsing in exhaustion with nothing left to give or perhaps less melodramatic as a lackluster performance even with hard work. Burnout is more than needing a mental break or taking a few days off. Burnout reflects a change in physiology where stress adaptation no longer responds. Increasing numbers of individuals in today’s demanding work force and even our youth experience burnout. In order to prevent and rejuvenate from burnout, it requires rest, self-care, and revitalizing nutritional support. Burnout reaches a depth of exhaustion and is real entity caused by unrelenting stress and chronic output. It affects productivity, mental, emotional and physical health in individuals in all walks of life across the globe. It results in billions of dollars of stress or burnout induced loss of work every year. It may be defined as physical or mental collapse caused by overwork or stress with a higher occurrence in professional work settings. The depth of burnout can be measured by the Maslach Burnout Inventory, which is a common useful self-assessment tool. Burnout syndrome is not just a mental thought or a feeling that one can snap out of. Burnout is the result of chronic stress that has changed the autonomic nervous system and the hypothalamic-pituitary-adrenal axis (HPA axis). Stress initially causes the brain to send signals to the adrenal glands, heart, and sympathetic (fight/flight) autonomic nervous system to activate or raise blood pressure and heartrate to deal with the stress and demands in a hyperactive manner. The parasympathetic (rest/relax) nervous system activity is overridden when stress persists. Constant demands, ongoing output combined with lack of rest and reward locks in the sympathetic nervous system activity. Eventually, the hyperactive HPA axis and the sympathetic nervous system (fight-flight) become exhausted. As burnout progresses, it turns into central nervous system exhaustion. The autonomic nervous system function has been stretched to the maximum degree and cannot maintain its normal function. There is a literal change with how the heart and autonomic nervous system function. Burnout is considered an independent cardiovascular risk factor. Men with burnout are more likely to experience a experience elevated blood pressure or heart attack. Even young adults and students experience increased cardiovascular stress from burnout. Heart rate variability is reduced in burnout which reflects a loss of autonomic nervous system balance within the heart and interplay with the HPA axis. Heart rate variability is important marker that can be measured with many personal devices and athletic training equipment. Loss of heart rate variability is associated with loss of health. Check out a previous article on Heart Rate Variability to learn more. Women with burnout, on the other hand, were found to be more likely to experience low morning cortisol levels. This gives rise to the classic signs and symptoms of adrenal fatigue including low blood pressure, cold intolerance, irritability, decreased endurance, inability to get out of bed in the morning, foggy head, and cravings for caffeine, salt and sugar. While the sympathetic nervous system has been hyperactive in stress and burnout, the parasympathetic nervous system function has reduced. This means that sleep, detoxification, immune system function, and repair are compromised. Digestion, bowel motility, and nutrient absorption are negatively impacted. Higher rates of irritable bowel syndrome, colitis, inflammatory bowel disease, GERD, and worsening of food allergies and intolerance and increased gut permeability may occur with chronic stress. Burnout leads to other changes with metabolism and increased inflammation. Neurotransmitters (serotonin, dopamine, GABA, acetylcholine) become depleted and lead to brain fatigue and mood changes. The immune system also becomes stressed and immunity is reduced making one more susceptible to infections and other immune challenges. Blood coagulation changes as the blood becomes thicker from inflammation. Headaches start or worsen because of overstimulation and hyperactivity of the sympathetic nervous system. These effects make mental tasks and cognitive skills harder. Depression, apathy, irritability, bad mood, increased temper, and less stress tolerance to the environment and people may occur. Burnout extends beyond this and can lead to secondary health changes. These include elevated cholesterol, type 2 diabetes, and coronary heart disease, hospitalization due to a heart disorder, musculoskeletal pain, fatigue, respiratory problems, and injuries. There is even a higher rate of death in those who are 45 years of age of younger. Burnout may lead to depression, sleep disorders, and increased alcohol intake. Burnout increases the risk of hospitalization for mental health disorders. Add these physiological changes to the loss of productivity within the workforce, family and social environment and the toll becomes enormous. Prevention of burnout is ideal. Restoration of resiliency will require many different tools. Nutritional support is one fundamental tool. Stress management and prevention of burnout can take many forms. Recovering from burnout is more than just taking time off. In Germany, where stress-induced absenteeism costs about 20 billion Euros per year or about 24 billion US dollars, officials have focused on the creative arts (art, dance, drama, and music) to help reduce strain. Activities that engage the parasympathetic nervous system to help build it up are necessary. Daily pleasurable relaxing activities that involve nature help the body to rejuvenate. Massage, yoga, chiropractic, prayer, meditation, sunshine, walking barefoot in the sand or grass, nature walks, viewing pictures of nature, playing with children and pets, watching and holding sleeping babies, classical or meditative music, mineral baths, and numerous other relaxation techniques can be employed to help rejuvenate the body. Rejuvenation from burnout also depends on nutritional fuel. If the fuel tank in the car is empty and the engine is hot from running, stopping a car will only allow the engine to cool off. The gas tank still needs to be refilled. This is where several key nutrients come into play and following a healthy diet, like The Leptin Diet. In a busy world, where the days are long, but the years seem short and pass swiftly, burnout can easily occur. Rest, replenishment, refueling the body, self-care and nurture are essential. Our bodies require quality foods and supplementation to offset daily stress and especially during the depletion of burnout. At least one day a week needs to be a day of rest away from work commitments. Some individuals may need considerably more rest time. If your dream vacation is to be on a remote tropical island for several months with no commitments other than to lie in the sun or hammock and take long strolls on the beach, it is likely that burnout is knocking on your door. Are you feeling a little crispy from life’s demands?